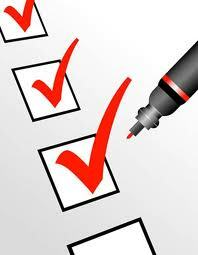 There really is a lot of satisfaction with making a list and checking things off one by one. I make lists all the time. I make grocery lists, Target lists, Things To-Do lists, work lists, packing lists, books-to-read lists, movies-to-watch lists, songs-to-download lists, lists for birthday gift ideas, and lists just to keep track of all my lists! Okay, that last list was false, but sometimes it feels like I need one of those too. Lists help keep me organized, they remind me of things I need to do, and they give me something to work towards. Like crossing or checking off everything from a list. When it comes to my aspirations in life, I have discovered that writing them down and/or having a deadline actually helps me accomplish them. How many times did I swear I was going to take an acting class?? Only a few thousand times. When I found out it was the last beginners class of the year, I jumped in. I decided it was now or never. Then I had a whole new set of challenges. I needed activities for class. I needed to memorize my lines. It was much easier to forget about it until the last minute, but then I started writing down the things I needed to do. Once I started advancing in class, I realized I had a whole new set of goals. I found that if I wrote them down, I was more likely to get them done. Accomplishing each task was satisfying! And I got to check it off of my list. With each checkmark came another goal to strive for and another challenge to overcome. I had to change my hair color, get my headshots done, sign up for Casting Networks, submit to projects, choose my headshots, build up my resume by working on short films, order my headshots, become SAG eligible, write a cover letter, clean up my resume, work on a monologue, go on auditions, and submit to agencies. I eventually accomplished all of these things, but not without a little help from my friends, a list or two, and a deadline for each of them. Every time I saw a checkmark next to my latest accomplishment, I was pleased because I was making progress and I could see it. Setting deadlines for myself seems to be somewhat effective, but I've found that making monthly goals over the course of 6 months is more my speed. For the month of June I had written down a few of my goals. MY VERY FIRST AUDITION SET UP BY THE AGENCY! The pay if I book it? $2,000. For one day of work. I am certainly not going to scoff at that! As I keep progressing, I will continue to check off my latest achievements. I like seeing that all of my hard work has been paying off!